This year I participated in the Ravellenics over on Ravelry for the first time. My goal was to only use my handspun yarn. Most are just small bags since I was using small skeins made from the samples from SpinningBox’s. I also tried a bit of felting, but I did it by hand so it’s not too much. I may throw those items in the wash at some point to felt them up more. Here are all the items I made! I fell behind in posting my projects (as usual) so figured I’d post what I’ve done so far at the end of June. I’m a bit late, but here we go! Added some decoration to my shelf, mostly to keep things from falling of the back. I have some other things to post, but will put them in their own postings later. I’ve not done too much as I have many hobbies and jump around, but I’m back into a crafting craze, so many more to come! The Pretty Basic shawl is a free pattern on Ravelry. I’ve been wanting to try other techniques with knitting, aiming to do lace eventually. This shawl is a great way to dip your toes into the water and get the hang of yarn overs. The pattern was very easy (I memoriezed it quickly and my memory is horrible!) and it’s fully written out. I have not learned to read charts yet, so this was perfect for me. The yarn I used is Knitpicks Stroll Tonal in the Koi Pond colorway. This was my first time blocking something. I don’t have any wires yet, just pins, so it’s not perfect. It’s fine for me though, so I’m not worried about it. I’ll probably do this shawl again in the future. Fun and fast. I finished in just over a week. I think it’s the fastest I’ve ever finished something. After I finished that baby blanket for my niece (see previous post), I finally started a project on one of my new looms. 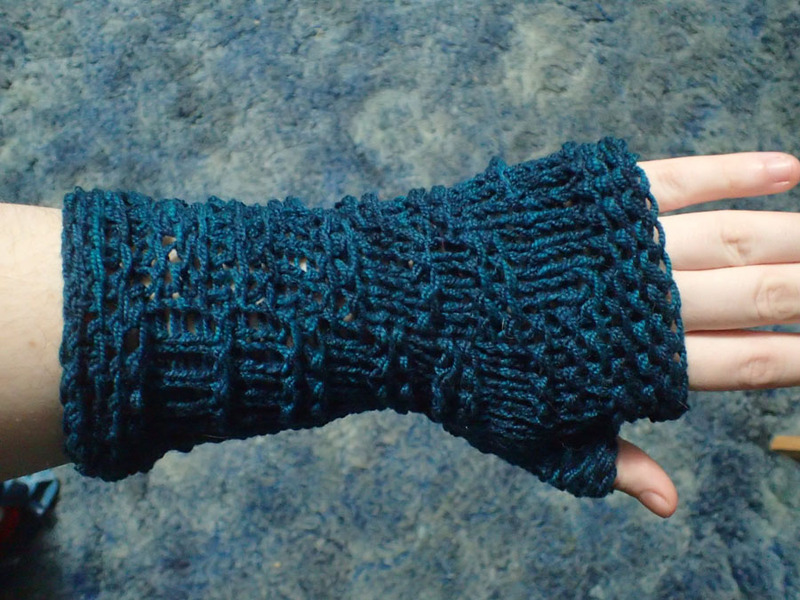 I used the fingerless glove loom from CinDWoodCrafts. 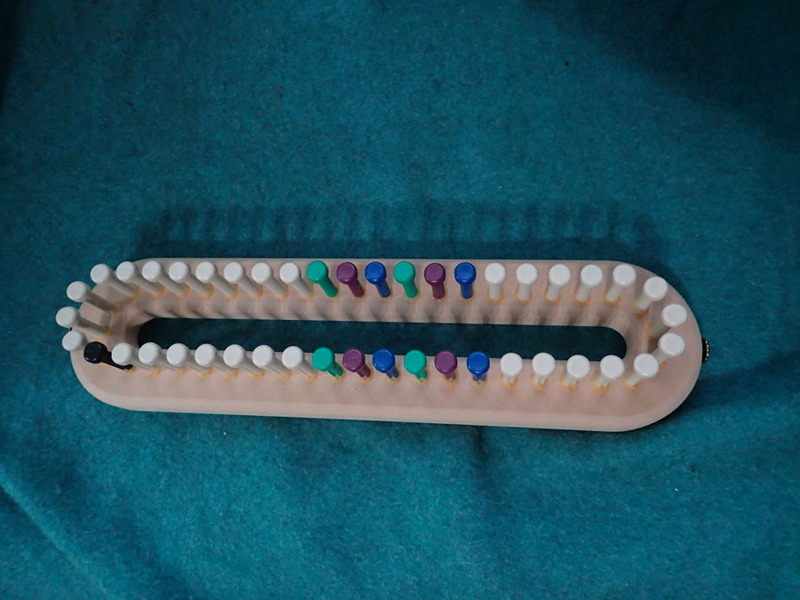 I really love this loom because the sizes are already marked in different colored pegs. There were many different patterns to choose from. I wanted something that wasn’t really complicated but still looked interesting. 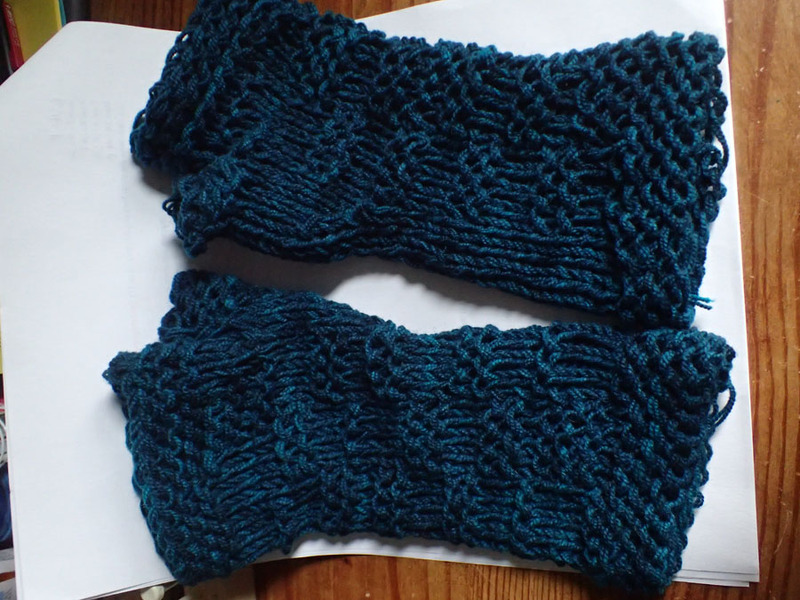 I picked the Inverted Garter Block Fingerless Gloves pattern (found both on Ravelry and the CinD website with the loom). I did struggle at first because I got confused about a part of the pattern, but after I figured it out, it went quickly. I did do it a bit different. I only did the block pattern on the front of the gloves instead of both sides of the body. This made less pegs to keep track of which is what I wanted for my first time doing fingerless gloves. I tried the first one on to test the fit to make sure I didn’t need to go up or down a size. It’s a little loose, but wearable. I quickly cast on the second glove and finished it in a few hours. The pattern looks like a mess in the above picture, but in person it actually looks right. The yarn I used was Lisa Souza Hardtwist Merino Petite in the color Portsmouth. I held it double since it is thin. The next pair I make will be using heavier yarn. My mother stole these right away, but of course we are now getting a week of warmer than average weather, so she’ll be waiting a bit before she uses them.